What a joy this is! I loved Sugar Fed Leopards first album Sweet Spots, but after seeing them live so many times I found the recordings didn't quite live up to my magic memories. This time around the songs all sound as great as I remember them, and there's all sorts of delightful extras sprinkled on top to further titillate the ears. 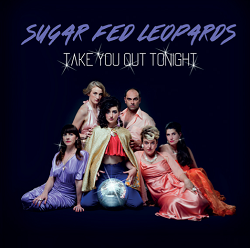 One of the things I love about Sugar Fed Leopards is that though they're ostensibly a disco group, the minimal drums / bass / guitar and 3 voices lineup, and the way they use it, makes them feel more like an early sixties rock'n'roll vocal group who stumbled upon the disco rhythm a decade and a half early. This record feels that way too, but it's souped up with lovely layers of saxophone, french horn, synthesizer and strings. The opening song 'Take It Slow, Katerini' takes us into full blown space-disco territory, with a delirious string arrangement, a whole lot of echo and a head-spinning alien opera guest appearance from Tanzer. While there's plenty of funky upbeat numbers, the album is liberally peppered with slow jams both sweet and moody. 'Secret' might be the finest contemporary soul slowie I've heard since Willie West & The High Society Brothers' 'The Devil Gives Me Everything I Need', while 'Hula Heatwave' is a dreamy Hawaiian style floater with a gorgeous trumpet solo. As a devoted Sugar Fed Leopards fan I am outrageously satisfied with this record and I can't wait to see it all come to life at Howler this Saturday night. Kelly Lee Owens’ debut album is a stunner. Deep, smart and moving – it's a curious and captivating tale. Years working in record stores and playing in bands give her a wealth of experience and knowledge to work with. What's so captivating is how she's able to cohesively blend techno, pop and ambient influences on this record. Beautiful, open production eschews the modern obsession with volume and compression – there's a confidence here that these sounds will find willing ears. Cunning psycho-acoustics give your brain little red herrings to chase whilst something unexpected rises out of the mix. Owens' voice effortlessly floats to wherever it needs to be to best serve a track. There's plenty of menace and tension – synth bass hinting at club punch that never arrives or the relentless chug of closer "8" – that lurks amongst the dreamy pop lines. This is deceptively sophisticated stuff. 'Anxi' features guest vocals from Jenny Hval – another master of subversive art – and a sinister bass line. The result sounds like Factory Floor making a lullaby record. 'Arthur' evokes the great and mysterious composer Arthur Russell without sounding anything like him. Owens has an uncanny knack for being able to bend a whole song from one place to another before you realise what's happening. 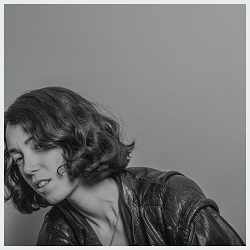 At a time when so much electronic music is being produced and released – from soundsystem frying techno to meandering ambient and shiny-scaled pop – Kelly Lee Owens arrives with a sound and feel entirely her own. She's carved a nuanced and distinct niche. It's now yours to explore.